On the run up to Saturday and the first Leicester Comic Con I must admit I was in two minds. You see, the weather was looking to be crazy hot here in London and I really wanted to get to a park and just relax. Added to that, on the Friday night I got real ill and it looked like all signs were pointing to not going to Leicester. Thing was though, I had been invited and made a commitment so I was going to go no matter what to Leicester Comic Con AND I AM SOOOOOOOO GLAD I DID!!!!!! From the warm welcome I got by the organisers to all the assistance from the helpers going around and even the lovely touch of a bottle of water waiting at my table I knew it was going to be a good day and then to top it off there was so many cool people who stopped by the table and were up for a chat (I do love a good blether you know). 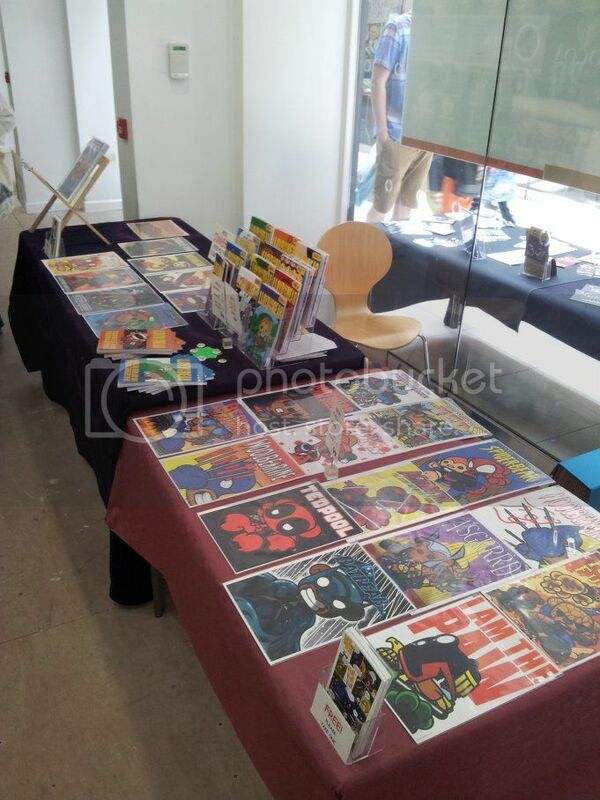 I was also lucky enough to get two tables for the convention and it ended up looking like this! And wouldn’t you know it, we even sold out of some stock! Whoops (but yay!)! So yeah, if this ever goes ahead again I really hope to get the chance to be back in Leicester as I had such an awesome time! Thank you!!!!! As for me, I now need to get back to working on issue #14! Busy!!! !